Pizza is the world most popular dish of Neapolitan origin, made with an oven- baked, flat, generally round bread that is often covered with tomatoes or a tomato- based sauce and cheese. Other toppings are added according to region, culture, or personal preference. Originating in Neapolitan cuisine, the dish has become popular in many different parts of the world. A shop or restaurant that primarily makes and sells pizzas is called a "pizzeria". The phrases "pizza parlor", "pizza place" and "pizza shop" are used in the United States. Base and baking methods The bottom base of the pizza (called the "crust" in the United States and Canada) may vary widely according to style—thin as in hand-tossed pizza or Roman pizza, or thick as in pan pizza or Chicago-style pizza. It is traditionally plain, but may also be seasoned with butter, garlic, or herbs, or stuffed with cheese. In restaurants, pizza can be baked in an oven with stone bricks above the heat source, an electric deck oven, a conveyor belt oven or, in the case of more expensive restaurants, a wood- or coal-fired brick oven. On deck ovens, the pizza can be slid into the oven on a long paddle called a peel and baked directly on the hot bricks or baked on a screen (a round metal grate, typically aluminum). When making pizza at home, it can be baked on a pizza stone in a regular oven to imitate the effect of a brick oven. 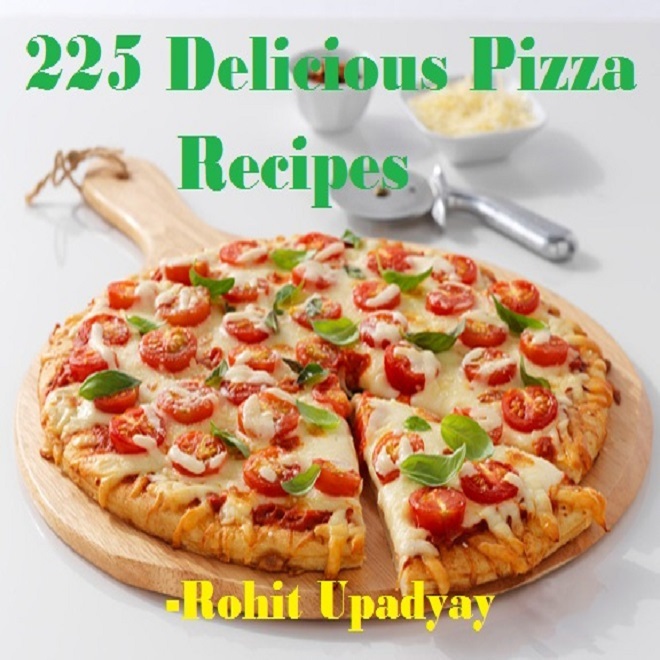 In this E-book you will know how to prepare 225 Delicious Pizza Recipes at the comfort of your home. In this way you will save a lot of money on your favorite dish without compromising your health.